Mix water and flax seed meal. Let stand. 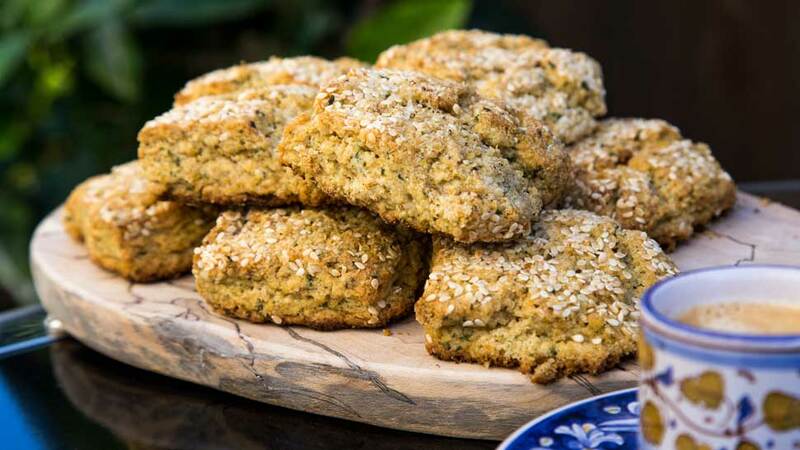 Combine dry ingredients: falafel mix, flour, sugar, baking powder. Cut the coconut oil into the dry ingredients until crumbly leaving pea sized chunks of coconut oil. Lightly beat flax seed meal mixture and almond milk. Make a well in the center of dry mixture and pour in liquid. With a spatula, fold gently until just combined. Do not over mix. Gently place dough on top of toasted sesame seeds and press lightly until even about ¾” thick. Cut into 2-3” squares. Flip over with sesame side and place 1” apart up onto baking sheet. Bake 15 min at 400 degrees or until lightly browned. SUGGESTION: Serve with tahini and date molasse. ALL CONTENT © 2012 TARAZI SPECIALTY FOODS, LLC ALL RIGHTS RESERVED.